Hey, hey, it’s Friday! As I’ve said before, just because we hit Beta 1 doesn’t mean we’re planning on slowing down anytime soon! We had a busy week, with plenty of testing, lots of updates to the builds, and we even managed to find time to send Andrew and Mark off to Dragon Con! If you’re there, check the schedule if you want to meet them at one of the panels! We’ll be running a test of Camelot Unchained during their panel Sunday evening, September 2nd. While the test will start earlier at 6 PM EDT, their panel will start at 8:30 EDT, but please check the con schedule if you are there, in case there are changes. This week saw a lot of tuning of building, building stability, and destruction, which have been moving along nicely. Sunday’s test will be the one from Wednesday August 29th, but more stable than the bleeding edge build we tested earlier today, and it will be open for IT, Alpha, and Beta 1 Backers. We’ll send out a separate testing email later with more info. Now for this week’s Top Tenish, where we cover the week’s highlights. Testing! We tested almost every day this week, giving you a look at damage updates, siege fixes, and hinting at what else we are working on. Dragon Con Test Event! Join us this Sunday, September 2nd, for our Special Dragon Con test from 6 PM to 10 PM EDT. Mark and Andrew are already at Dragon Con, and will be speaking in a panel at 8:30 PM EDT Sunday. Tech – WIP – Siege, Damage, and Stability. Armed with great test feedback from you folks, we continue to iterate on building stability, damage, and destruction. Construction, destruction, and stability all interact with each other better. In particular, we fixed the construction/destruction loop. Blocks now use their own stats per block type, vs. shared generic stats. Damage on siege has been modified to reflect the new block stats. Art – WIP – Armor Pieces. Specifically, work was done on additional heavy helmets and pauldrons. Joe is importing assets previously created by Jon, while Jon is working through new pauldrons, which will be used later in the character 2.0 pass. Once the helmets are in, we’ll turn a few of them into items with crafting recipes and add them to the game. Art – WIP – Medium and Light Helmets. The helmets mentioned above are only heavy helmets. Sandra is working through a new pass of concept art for light and medium helmets. She already has four pages of sketches! Art – Animation updates. Ongoing work to update our animations and animation system has begun. 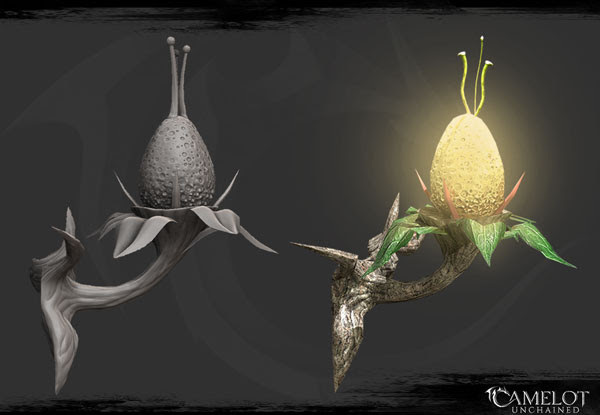 A fair bit of this work is R&D to find a more elegant solution to support our unique skill system. WIP – Tech – Entity Persistence: One of the first steps toward having a truly persistent experience in the game is building out our entity persistence framework, which Caleb and Andrew have been working on. This is a longer-term task that is a real foundational stepping stone for CU. E.g., entities such as resource nodes retain their last state after a restart. UI – Bug Fixes. AJ was on a roll this week, fixing several high-visibility bugs, including: A bug where some system messages were getting dropped by the UI, a bug where if you left your patcher open a long time, new characters wouldn’t show up in the list, and a bug where if you left your patcher open a long time, clicking “Create Character” would fail. Thanks, AJ! Tech – WIP – Lighting. Last week, we added some significant light updates. This week, we continued that work, adding additional area light shapes and tuning the parameters for the best visual fidelity. Tech – WIP – Skills and Abilities. We plan on doing a lot of work on the skills and ability builder soon. So this week, time was spent cleaning up the ability builder code and some of the unused skill parts. 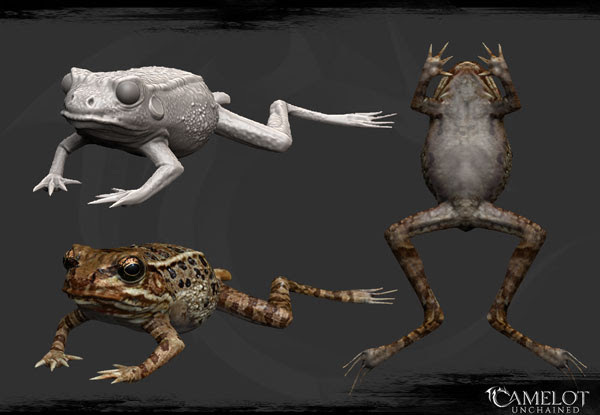 Tech – WIP – Decoupled entity and physics actors. Wylie, one of our new junior programmers, has been working on eliminating an entity-level dependency to help us improve our prediction and to improve our ability to use and place entities. WIP – Art – Environments. Dionne is currently working on a resource library for creating new assets, with a focus on European environments. 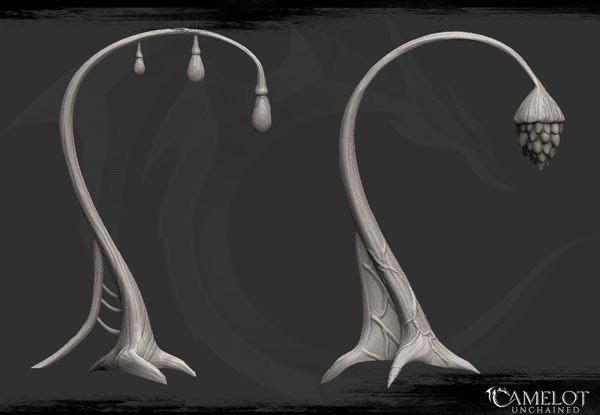 She’s also continuing to pump out new props for players to use later. 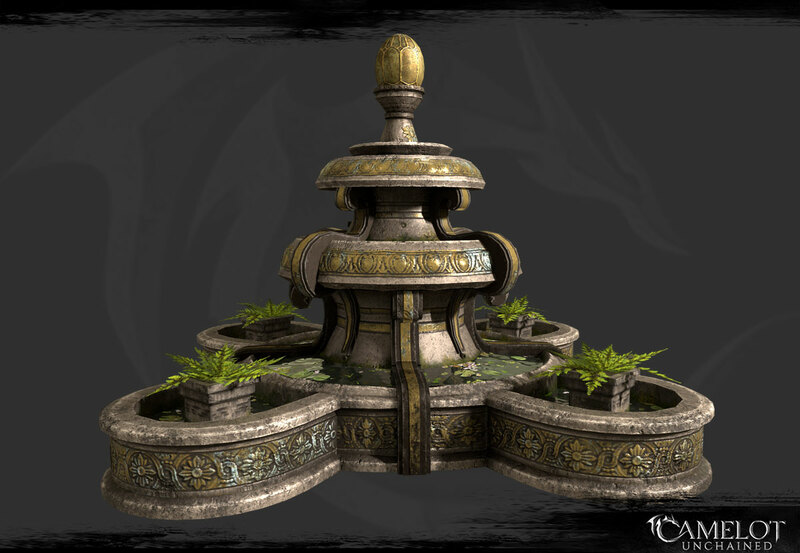 In this case, new fountain assets! We’ve got a lot of different cool systems coming along this week. It’s been particularly interesting to see not only the great performance of building destruction, but also how it behaves, and getting that tuned and improved. For art this week, we start out with animation. In the below video, we have an out-of-game render of some of the work created leading up to the start of Beta 1. 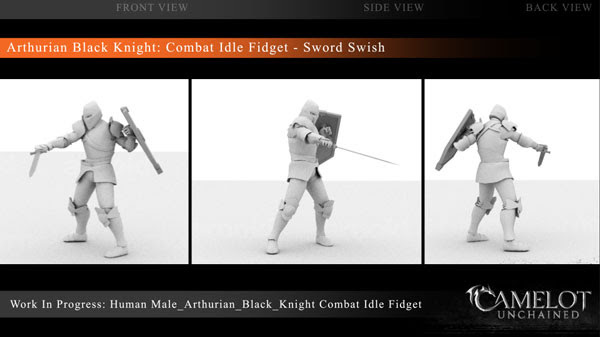 This video first shows a combat fidget created by Joe for the Fianna, then one made by Scott for the Black Knight, who also made a low-occurrence death of the Viking Mjölnir class. Credit for the idea of the Mjölnir death totally goes to Mark, who wants to make sure we have a bit of fun in Camelot Unchained. 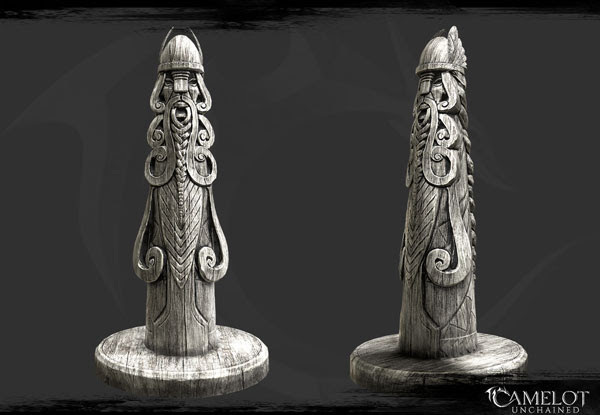 Next up, we have a Viking statue Jon created which rests at the end of the main dock on the Viking home island in Midgard. This was actually based off a real-world design. 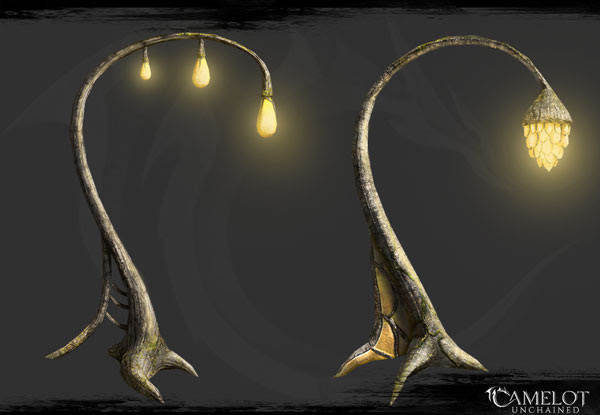 Based off Michelle’s concepts, we wanted Realm-specific lamps for our home islands. In this case, we hadn’t yet created anything really unique for the TDD, so we went with something that looked like it had grown up out of the ground. We continued that treatment later for wall-mounted lights. 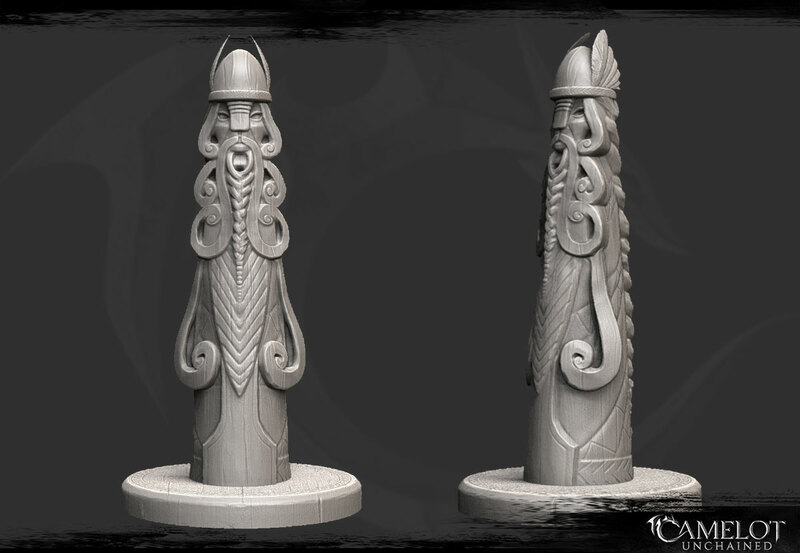 We’ll get these into the hands of players later, as something that can be crafted and placed in or around your building plot. 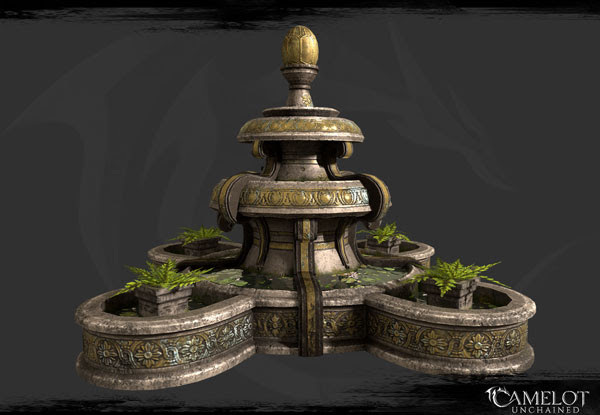 Dionne also made this great fountain! This was something I wanted to get into the home island, but we ran out of space to keep adding props. 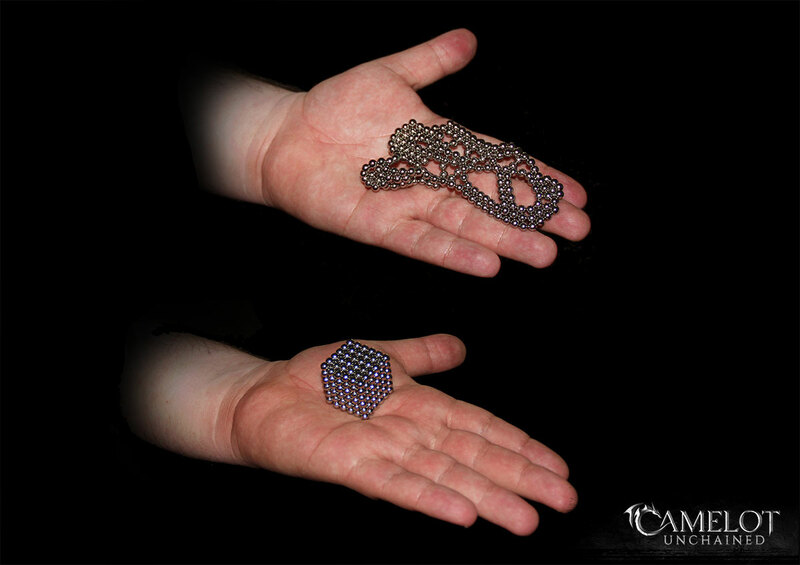 She took this asset and made three variations, and the largest is pictured below. Sometimes it’s the little things that add a bit of flavor to the game. In this case, we did a special ability animation for the Arthurian Physician that needed to be more than just “pull out a bottle and throw it.” We decided to use a big jug, and created an animation where he takes something out of his pockets and places it in the jug. Ideally, we can use this single animation for different components. In the end, we had him put a frog in there. Jon pretty much pleaded to make it for us. I’m going to wrap up the art section, because we have a bunch of thank-yous we need to cover. Leading up to Beta 1, we stopped doing the end-of-the-week updates in which we thank Backers for gifts they send to the studio. We did that so we could focus on getting into B1. Thankfully, Max kept a long list going! So I’m going to try and cover some of those this week, and I’ll finish up the rest next week. 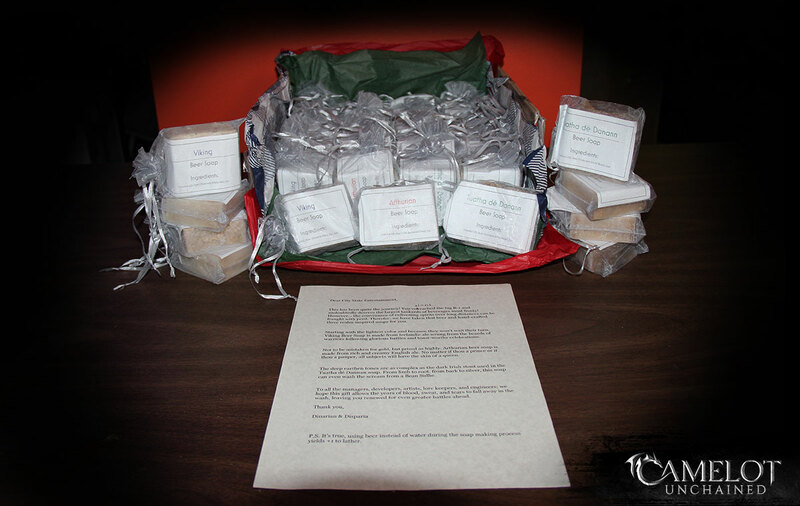 Clearly, there were quite a few gifts, so I just want to start off with a big thank-you from us at CSE! You guys are a wonderful and thoughtful community. I’m going to lead off with gifts Max received while he was out on paternity leave. 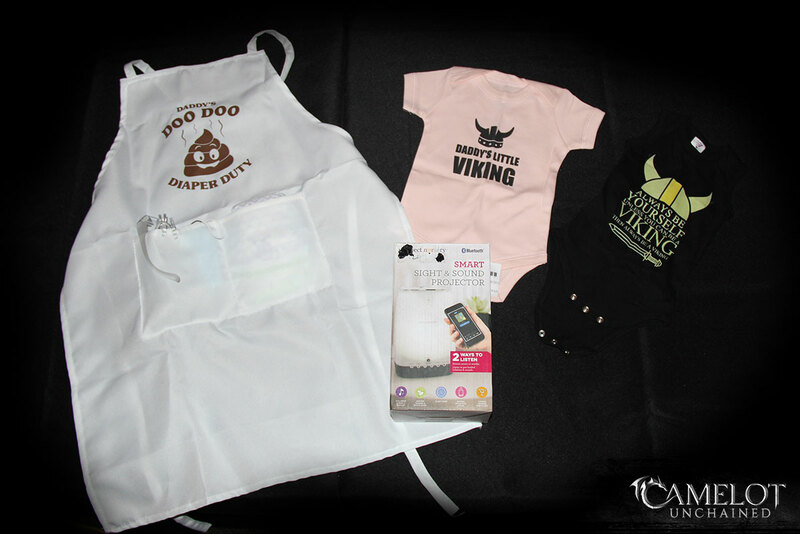 Thank you to Lawtoween for these adorable Viking pride onesies! Thank you to Paladin Brewer for the smart sight and sound projector. I’m sure Max will make great use of this on those sleepless nights. Also many thanks to Poxer, who sent the hilarious daddy doo-doo diaper changing kit! 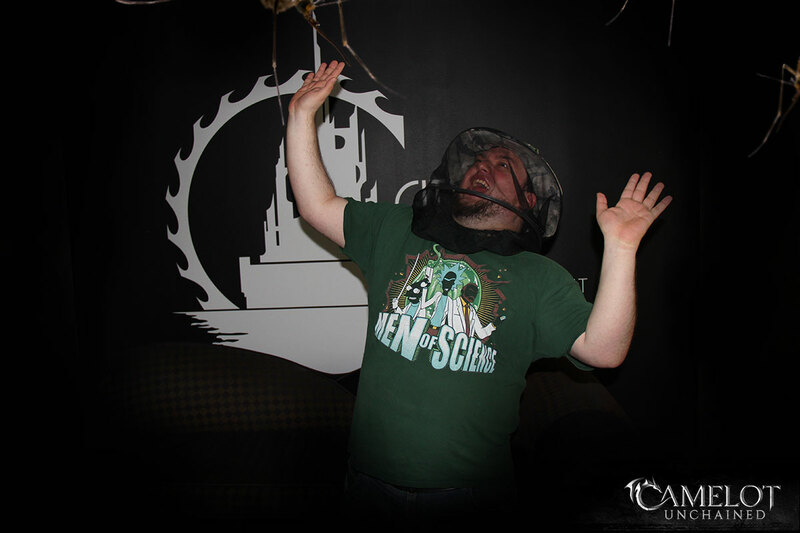 Previously, we had this hilarious … I don’t know what to call it, a bug protection hat? This was gifted to Max by Poxer. There was this large box of Viking beer soap sent to us from Dinarian & Disparia! We all had a chance to take a bar or two home. I can tell you my wife said, “You have what in your hand? Beer soap? !” Also special thanks for the well-written, heartfelt letter. Next, we had these magnets for JB, for all his fidgeting needs, from Paladin Brewer. 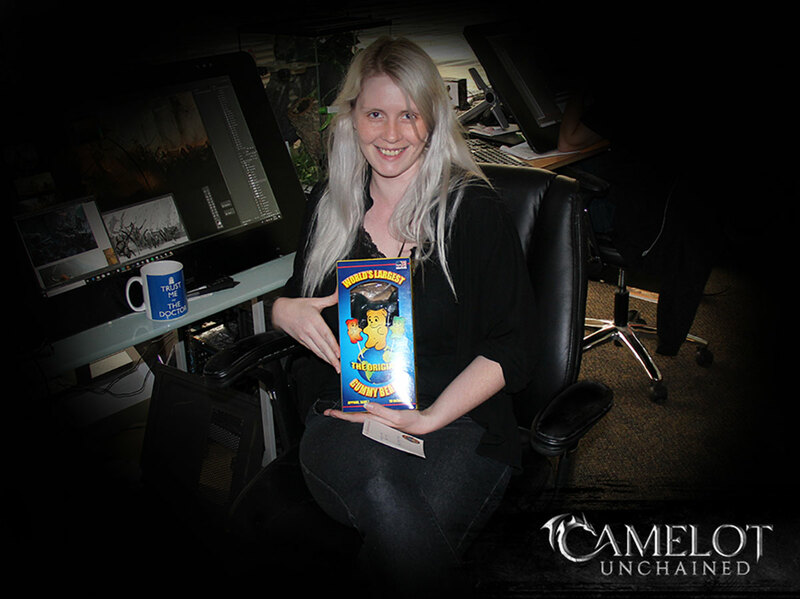 To end the thank-yous in this update, Paladin Brewer also sent Michelle this giant gummy bear! I honestly didn’t know this was a thing. That wraps up this week’s update. For those of you with Beta 1 access, we look forward to seeing you on Sunday’s test. Testing email coming later this evening with more info! Have a great weekend, all!